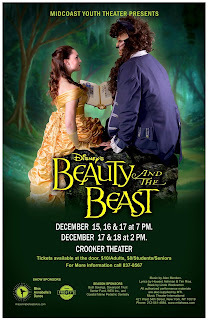 Midcoast Youth Theater with support from Frosty's Donuts and Miss Annabelle's Dance is proud to present Disney's Beauty and the Beast on Thursday, Friday and Saturday December 15th-17th at 7:00 PM and Saturday and Sunday December 17th and 18th at 2:00 PM at the Crooker Theater located in Brunswick High School. 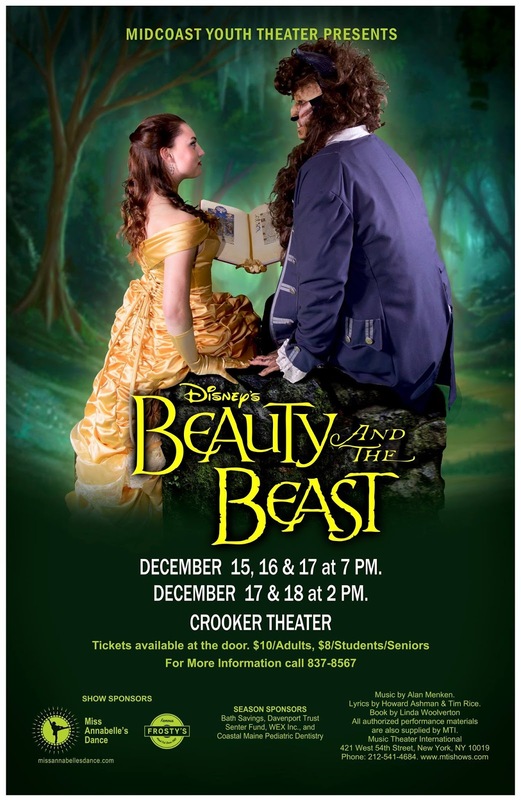 Our cast of over 100 people led by the talented Belle and Beast, played to perfection by Julia Nadeau and Ben Proctor, will take your breath away. Bring the whole family! Tickets are $10 adults and $8 seniors and students. A live orchestra accompanies all performances. Tickets available at the door or online here. Thanks also to season sponsors Davenport Trust, Bath Savings Institution, Coastal Maine Pediatric Dentistry, WEX, Inc. and Senter Place Fund.